I’m a planner. It’s a big part of my job, but it’s also part of my personality. Vacations, holiday celebrations, weekends—I want them all planned out. Unsurprisingly, then, I’m planning out every aspect of making this sweater before I actually start knitting. My go-to place for information is the materials section of the pattern. In Interweave Knits, this box lists the finished garment sizes, yarn, needles, notions, and gauge. For a planner like me, this is heaven: all the information I need about supplies is in one place. I assembled a list of all the things I’ll need for this project and took a trip to My Sister Knits, a delightful local yarn shop here in Fort Collins. Next on the list is needles. After consulting resident pattern expert Laura Hulslander, I determined that I’ll need size 8 and size 9 circular needles, which I’m picking up at My Sister Knits. 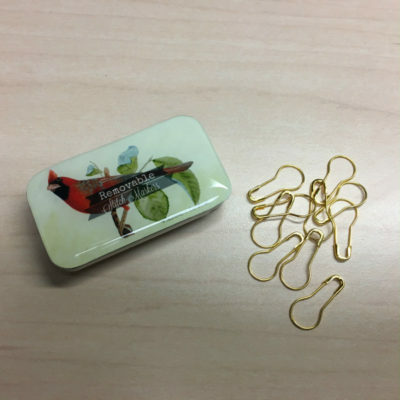 The pattern also calls for a straight needle, which we have around the office, so I’ll just borrow those when the time comes (one of the many perks of working at Interweave!). I just love this stitch marker case! Such a handy and beautiful way to keep track of my new markers. And that’s it! (Well, there’s also gauge, but I’ll talk about that later.) With my materials assembled (in this awesome bag crocheted for my by the lovely Sara Dudek! ), I’m ready to tackle the next thing on my list: reading through the pattern. Before I start knitting, I want to make sure I understand all the stitches and instructions. I also need to choose a finished size and think about any possible modifications to make this sweater flattering for my body. More on that next week! 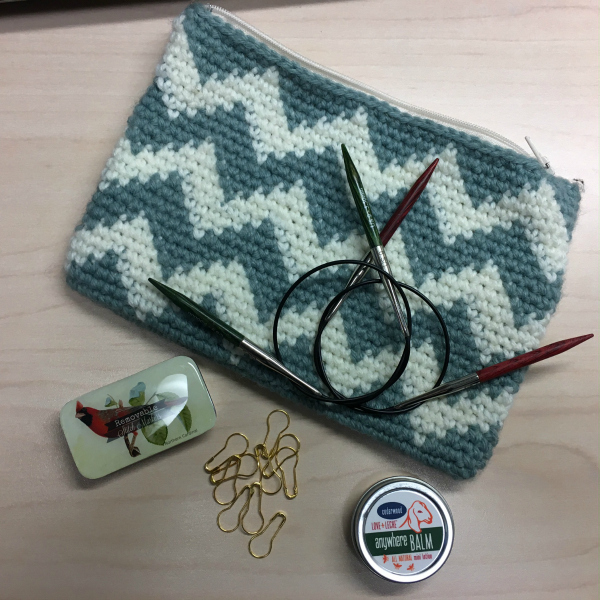 Notions: Most of the things I’ll need to knit this sweater. 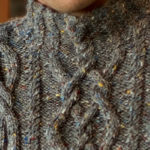 Free Men’s Sweater Patterns You’ll Love Knitting!